Key friends and advisors of the Lazaridis School of Business and Economics gathered recently in New York City for a high-impact networking session. The event, a partnership between the Canadian Consulate and Laurier, focused on entrepreneurship, cutting-edge banking, financial technology (“fintech”) and the future of business education. 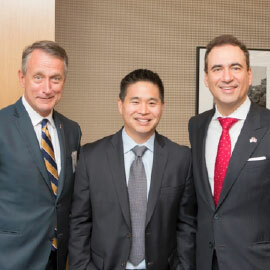 Close to 100 people attended, including 20 Laurier alumni and senior university representatives, hosted by John F. Prato, the Consul General of Canada. Brad Katsuyama (’01), CEO and co-founder of the Investors Exchange (IEX) and hero of the bestseller Flash Boys, gave the keynote address on the growing influence of fintech and its disruption in the financial services sector. Katsuyama founded IEX after insisting on the need to provide an exchange that could match buyers and sellers without allowing intermediaries, such as predatory high-frequency traders, to get in the way. Another Laurier alumnus, Stuart Goldfarb (’92), provided the venue for the event at his offices at Dorsey & Whitney, LLP. The event was part of the ongoing outreach efforts of Micheál J. Kelly, dean of the Lazaridis School of Business and Economics, to raise awareness for the Lazaridis School, and was supported by the Dean’s Advisory Council in NYC. To assist him in building the profile of the Lazaridis School at home and abroad, Kelly has formed Deans Advisory Councils (DACs) in New York City, Ottawa, Calgary, Silicon Valley, London, England and Waterloo. The prominent alumni and industry leaders who serve on the DACs play an integral role in identifying and driving priorities for the Lazaridis School. ”Brad Katsuyama’s success, based on both his skill and ethics, is an outstanding example of Laurier graduates who are leading lives of leadership and purpose,” said Rob Donelson, vice-president of Development and Alumni Relations at Laurier, shown (left) with Brad Katsuyama (centre) and John F. Prato (right).